As the Emergency Services Medical Director at Good Shepherd Health Care System Robert McCauley, MD, is working to address the emergency needs of our community with a focus on reducing wait times and improving each customer experience regardless of the emergency they may be experiencing. 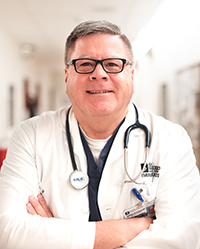 HERMISTON, OR – Good Shepherd Health Care System (GSHCS) is excited to announce Robert McCauley, MD, as the new medical director over Emergency Services (ER). GSHCS is a full services ER and Level III Trauma Center which cares for over 20,000 community members each year. Dr. McCauley is joining GSHCS from Team Health, a National Medical Group, where he served as Regional Medical Director over all Team Health physicians in the Pacific Northwest. “As one of the first points of contact with any health care system, the ER needs to be a place where people feel they are receiving competent, compassionate and prompt care. GSHCS has a talented group of physicians, mid-levels (Physician Assistants and Family Nurse Practitioners), and nurses that are well trained in caring for the communities we serve during their emergency situation. As a Level III Trauma Center, we are equipped to care for some of the most challenging conditions that come our way. As the Medical Director, my goal is to continuously work on improving – reducing wait times and improving each customer’s experience regardless of the situation they may be in. Our team of physicians and clinical staff are trained to manage and care for our community in most emergency situations. We work with our patients to find tertiary emergency services at other facilities if the need arises where access to additional specialists is readily available,” affirmed Dr. McCauley.